And so we had a name. The eagerly awaited announcement following the birth of the new Princess was fuelled by much speculation and guessing. Not being overly fond of the Royal Family I didn’t particularly join in, though neither was I anti all the fuss either. Names are important. Hugely so. Up until the announcement the Princess had simply been referred to as the Royal Baby. Nothing wrong with that. We all know who people are talking about when they use that term. She is, after all, a Royal Baby. Or is she? Does that name really define her? In part it does. But only in part. It’s a label. It does not define who she is. Without wishing to sound disrespectful… she is Charlotte. Princess Charlotte of Cambridge, to afford her the title she has been born with, but she is still Charlotte. Whilst her life will be undoubtedly be influenced by all that she has been born into, it still will not define her. She is Charlotte first and foremost. Royal Baby is a label she will carry until it changes into the next label; Royal Toddler, Royal Child, Royal Teen until eventually she will ‘simply’ be Princess Charlotte of Cambridge. Her entire life will be marked out by a label. Whether she likes it or not. It’s a label that is used to set her apart. A label that tells us she is different from the rest of us and should be treated differently. It’s a label that carries both privilege and burden. Hazel has a label. It’s one we try hard to lose. It’s a label that I used to use myself. About other people. Before I had Hazel. Before I knew how hurtful it could be. I didn’t mean to. Already, in her short life, she has been labelled. On (thankfully) rare occasions, it’s a label that has extended to the rest of our family. That’s the girl with the Down’s sister. For the pregnant woman it’s a label that ensures swift and unquestioned access to an abortion clinic, if she so desires. It tells her all she needs to know. It tells her to be afraid. It tells that this is the worst thing. It speaks fear over her life, over her hopes and dreams. It tells lies to her. It does not tell her the whole story. It lets her down so badly. It’s a label that we will fight to lose, though I am NOT embarrassed by it. I simply question why it is needed. I question why society wishes to set her apart? As if her extra chromosome was all that mattered. It isn’t. What are we so afraid of? Having said that, I am aware of some people who desire a label. The mother of the autistic child who so desperately wants others to understand why they behave in the way they do. Tired of judgemental looks and ‘tuts’ as they do battle with their sensory overloaded child to get round the supermarket or eat dinner in a restaurant. Not all labels are bad. It’s how they are used that’s the problem. This week Hazel has learnt to say her own name. She delights in looking into the mirror and repeating it, over and over again. We have spent the last three and a half years teaching her what her name is. It’s the only ‘label’ she knows. Well, that and ‘pickle pants’! I look forward to the day when I tell her what her name means and why we chose it. Hazel means ‘protected by God’. We chose it before we knew she had Down’s syndrome. I sometimes take a deep breath when I think about the future. I worry about the day Hazel becomes aware that society has given her another name; a label. I worry for her sister that others will use this label as an insult or a put down. She doesn’t see the label. She sees her sister. She sees Hazel. 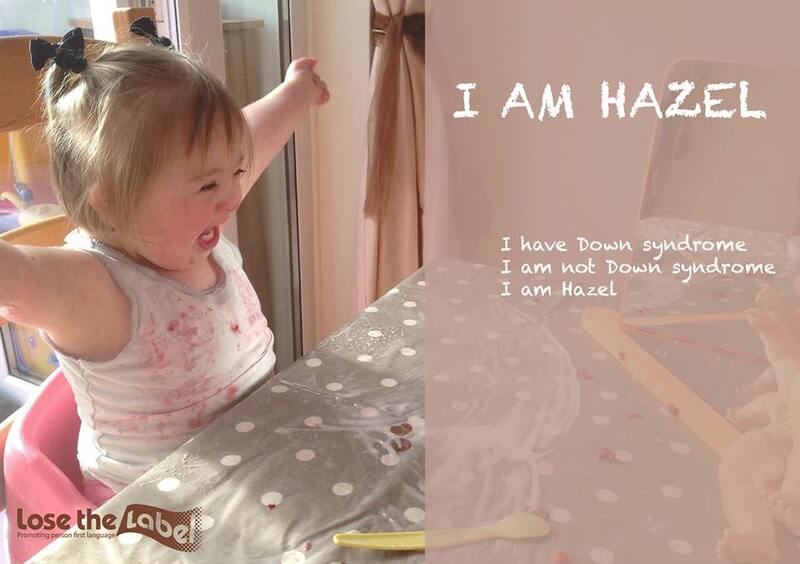 Whilst Hazel’s life has, is and will continue to be affected by her extra chromosome, it still will not define her. She is Hazel first and foremost. She just happens to have Down’s syndrome. Let’s lose these unhelpful labels. Whether they are a burden or a privilege to carry they do not define anyone. We were privileged to take part in the Lose the Label campaign. Promoting Person First language the campaign features people with Down Syndrome of all ages, all cultures, from all around the world. 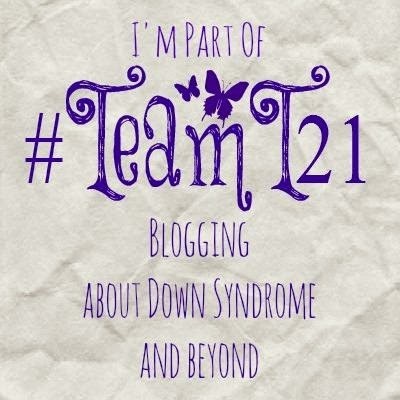 Categories: Acceptance, Down Syndrome, Down's Syndrome, Prenatal Testing, Trisomy 21 | Tags: #downssyndrome, #downsyndrome, #losethelabel, #personfirst, #royalbaby, #Trisomy21 | Permalink. How you find the time to craft such amazing blogs I Will never know Alison! Congratulations on another amazing read. You are such a natural at writing in such a way as to open the eyes of the reader! Ah well I don’t write that often…that’s one answer and when I get the layby all to myself with NO ‘distractions’ 😉 ….it kind of flows…..